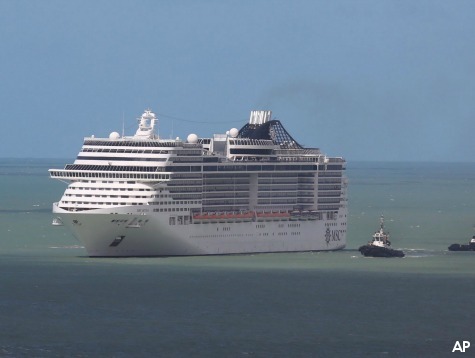 Panic has swept through a luxury cruise liner following the discovery on board of a laboratory worker who handled clinical samples from Eric Duncan, a Liberian man who was the first person diagnosed with Ebola in the United States. The ship has been prevented from docking at Belize and Mexico, and is now en-route back to Galveston, Texas. The laboratory worker is being kept under voluntary quarantine in her quarters, and the ship is being thoroughly disinfected, but that hasn’t stopped passengers fearing the worst. “It’s really difficult to control any type of virus that’s on a cruise ship. It’s like a floating petri dish. It spreads very rapidly,” commented one passenger. The cruise ship Carnival Magic set sail from Galveston five days ago for a week long cruise around the Caribbean, with a scheduled stop at Cozumel, Mexico. The lab supervisor, who has so far not been named, joined 3,689 fellow passengers and 1,367 crew, as she was not subject to any travel warnings from either the Texan Health Presbyterian Hospital in Dallas, Texas, where she worked and Mr Duncan died, nor from the US Centres for Disease Control and Prevention, the Telegraph has reported. She was only required to self-monitor by taking her temperature daily. Whilst aboard the ship she viewed news reports about the two nurses, Nina Pham and Amber Vinson, who worked at the hospital and have now been diagnosed with Ebola, and decided to report herself to the ship’s captain. She also voluntarily quarantined herself by staying inside her cabin. The ship’s captain decided to attempt to put in to port at Belize so that the woman could be flown back to Texas, but the Belizean authorities refused to allow the ship to dock. Dean Barrow, the Prime Minister of Belize even refused a personal appeal from John Kerry, the US Seretary of State, to allow a helicopter to pick up the woman. It was whilst off the coast of Belize that other passengers began to suspect that something was wrong, as many noticed first that the ship was stationery about five miles off the coast, and then that it began to pull away from the nearby port. One passenger, who gave his name to CNN as Michael, told how he had first noticed something was amiss when the map on the television screen in his cabin showed the ship’s current course. “We were supposed to put into a port and I noticed that we were pulling away from the port,” he said. “The captain finally came on and said we couldn’t get permission to port. “That’s when everything hit the fan here and we realised we were quarantined. “There were all kind of rumours. They never really said Ebola, they said ‘symptoms,’ they kept it somewhat vague but everyone knew what they were talking about. “Obviously our concern is where is this person is on the ship and what kind of set up do they have to care for them? I can’t imagine it’s a completely quarantined area. They have not told us at all where the person is. Other passengers described panic amongst the guests, and how a cleaning operation was underway on the ship. Jon Malone commented “People are scared. I’ve seen people crying. You’re using the same buffet line as someone else, the same waiters, the folks that clean the state rooms. “If someone was cleaning their state room and cleaned yours right after, the exposure that you have there to elevators…it’s very tight quarters and a lot of interaction. His brother Jeremy added “You see a ton of people that are crying, and then there are folks that are having a drink. Having been refused permission to dock in Belize, the captain then set a course for the scheduled stop of Cozumel, Mexico, where it was hoped that the lab worker could again be disembarked and flown back to the US. However, Mexican authorities also refused permission to dock. Ebola has a maximum incubation period of 21 days. As it was nearly three weeks ago that the lab supervisor handled the samples, and so far she has not shown any symptoms, it is believed that she does not pose any risk to the crew or passengers aboard the liner. Carnival Cruise Lines has now distributed a letter to each passenger, informing them that “At this time the guest remains in isolation on board the ship and is not deemed to be a risk to any guests or crew. The US State Department is also working with the company to bring the Carnival Magic safely back to Texas “out of an abundance of caution”. Following the death of Mr Duncan from Ebola last week, there has been widespread panic throughout America over Ebola. In one incident, an entrance to the Pentagon was closed, and Ebola precautions put in place after a woman was sick in the car park, despite there being no evidence that she had contracted Ebola. He added that he would not be cancelling air travel to West Africa, saying “Trying to seal off an entire region of the world, if that were even possible, could actually make the situation worse.